SAVING MONEY IS A BEAUTIFUL THING! PREMIUM SOLAR ATTIC FANS - YOU CAN FEEL THE SAVINGS! VENTILATION IS KEY TO REDUCING YOUR HVAC COSTS! RESIDENTIAL, COMMERCIAL AND UTILITY APPLICATIONS. With over 30 years of product development experience, the Solar Royal Team has tediously developed the most advanced solar attic fan (solar ventilation) on the market. 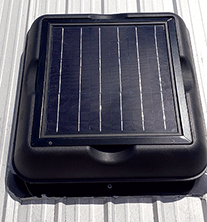 After years of market research and gathering information from various industry professionals, we have created the most efficient, durable, and easy to use solar attic fan you can buy. We would like to earn your business by providing accurate information and to help you understand the differentiating features to others. The SR1800 series solar attic fan has been engineered to perform in any inclement weather, passing the most recent (2016) rigorous certification, ASTM-E330 & TAS100a-95, which is required by many types of insurable properties. The automotive grade ABS stands up to the mightiest of natural forces, reinforced with the highest quality aluminum components and stainless steel fasteners. The energy saving, solar roof top mount maximizes sun exposure for the best performance. The easy install design allows your certified installer to get your system up and running in no time. Our solar ventilation products are designed to be used in any residential, commercial, agricultural, and utility application. Our SR1800 series beats out all competitors with its superior solar energy technology for high efficiency and clever design patented for both aesthetics and functionality. While other products stick out like a sore thumb on your roof top, our low profile design ensures our customers that their roof top will look pristine, regardless of installation location. 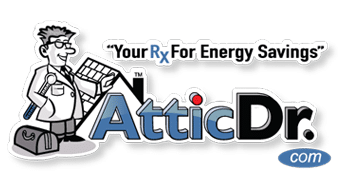 Unlike our competitors, our solar attic fans come with a patent-pending, two-piece design with our ‘drop-and-lock’ feature, which allows seamless access to your roof and never having to jeopardize the water-tight flashing. We would like to invite our customers to thoroughly research the solar energy market because we are confident that our green energy products are superior to all other options. Simply put, we believe we offer the best solar ventilation solution on the market, but feel free to contact and give us the opportunity to show you why we have the best solar attic vent fan > Dare-to-Compare! tile, sod (grass) or snowy conditions. Monocrystaline is the best quality and highest efficiency solar panel available in the ventilation industry. Beautiful design that blends nicely on any type of roof and can be painted to match it’s surroundings. Embedded angle bracket system included with seven locking stages. Low-profile with all the features. Engineered with features and performance unmatched in the industry. 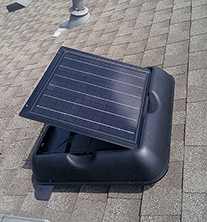 Solar Royal offers - The Best Solar Attic Fan Ventilation Solution on the Market! No other solar attic fan offers the features, looks and value offered by the SR1800 series - PERIOD. The Solar Royal SR1800 is the best solar attic (ventilation) fan on the market. You will not find a better built, robust featured, ‘patent-pending’ two piece design for easy installation & maintenance and high-quality brushless motored solution. Considering other green energy ventilation alternatives? Check out our product comparison page and see how our ventilation fans stack up against the competition. Have more questions? Contact us via LiveChat, SupportDesk Ticketing System or Phone during office hours. ** Be sure to stop video before closing window. Click to see why the SR1800 is the best quality & highest featured renewable energy product on the market. One look and you’ll see how! The Solar Royal SR1800’s ‘patent-pending’ “two piece” design allows the hood to be removed without jeopardizing the water-tight flashing seal. Also in the event the angle bracket pivot was not positioned correctly the hood can be easily turned. Have questions about how our renewable energy ventilation solution stacks up against the competition? Contact us via LiveChat, SupportDesk Ticketing System or Phone during office hours. Click to see how the patent-pending two piece design make the SR1800 Series so easy to install and also maintain & accessed as needed. The Solar Royal SR1800 ‘patent pending’ two-piece design and industrial grade aluminum base is the industry leader in ease of installation which also helps ensure a secure and water-tight seal. Also, if you ever need to access the attic or unit, the water-tight seal never needs to be touched. If you are still not seeing the value of our green energy ventilation solution, contact us via LiveChat, SupportDesk Ticketing System or Phone during office hours. Click to see why the SR1800 Series is redefining ease of installation and maintenance . No other attic fan is this easy to install and access. The Solar Royal SR1800 Series offers versatility like no other. With its modular design you can add a 6″ riser to accommodate installations that support sod (grass) roofs, tile roofs and even in snowy weather locations. Also the riser is helpful when needing to make a ‘not-so’ optimum installation location better by raising the hood another six inches. Click here to see another patent-pending feature allows the SR1800 Series to be so modular. Easily the most versatile product on the market. The purpose of proper solar powered ventilation is to reduce temperatures inside enclosed spaces throughout the year, like your attic space, crawl spaces, warehouses, storage areas, sheds, barns, etc. In the summer, our solar powered attic fans help make all these areas more comfortable by converting passive ventilation to active. Thus reduces HVAC costs and cooling cycles, which also saves energy and money. 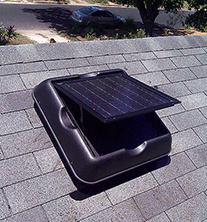 Solar powered attic fans help reduce hot air in your attice space. Attic heat can cause the premature deterioration of shingles, roof boards, sheathing, siding, insulation and stored valuables. Proper ventilation is direct result of proper installation. A WATT SAVED, IS A WATT EARNED! Solar Royal offers – The Best Solar Attic Fan Ventilation Solution on the Market! For more information on our solar attic fans or other solar powered attic fans check out our product information page. You might also be eligible for solar tax incentives. View solar tax credit and rebate info. 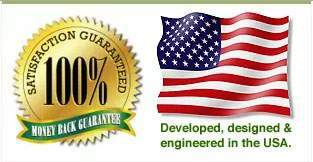 Become a certified installer of Solar Royal solar attic fans. Visit our warranty information page and get product registration details for our solar attic vent fans. For more great solar powered ventilation products, visit our online store or contact us via LiveChat, SupportDesk Ticketing System or Phone during office hours.